The design is an adaptation of a part of the Carte de la partie de la Verginie ou l'Armée Combinée de France & des États-Unis de l'Amérique...avec la Plan d l'Attaque d'York-town & de Glocester, said to have been drawn by a French eyewitness to the siege of Yorktown and published by Esnauts & Rapilly. French and American troops under the command of General George Washington lay siege to the British troops under Charles Cornwallis at Yorktown, Virginia in September 1781. Cornwallis surrendered on October 19. The French under Comte de Grasse, and the British under Sir Henry Clinton fought for four days before de Grasse barred the Chesapeake Bay and the British fleet withdrew in September 1781. 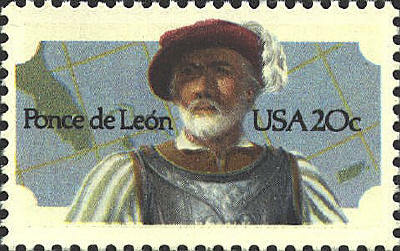 Juan Ponce de León was a member of Columbus' second voyage to the Western Hemisphere in 1493. In 1508 he explored Puerto Rico, and in 1513 he discovered Florida in his quest for the Fountain of Youth. The map in the background suggests the areas of his explorations.